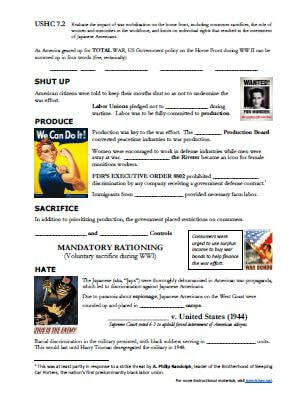 Standard 7 addresses the causes, course, and consequences of World War II, as well as the United States' role as a world leader during the postwar era. 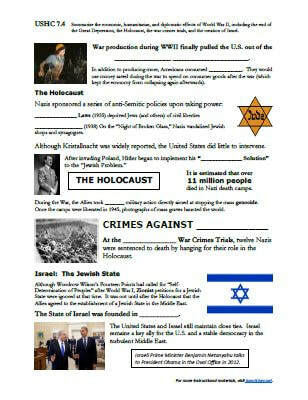 The key topics addressed by this standard are Isolationism, World War II, the Holocaust, the Cold War, and Postwar America. 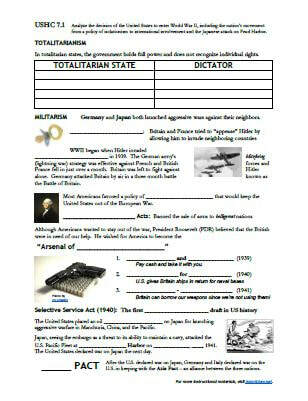 Analyze the decision of the United States to enter World War II, including the nation’s movement from a policy of isolationism to international involvement and the Japanese attack on Pearl Harbor. 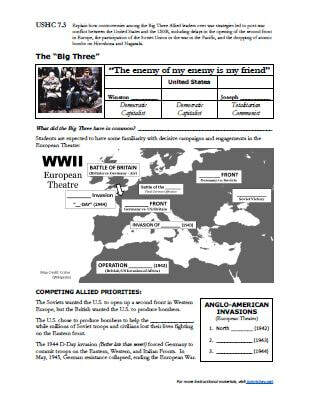 Explain how controversies among the Big Three Allied leaders over war strategies led to postwar conflict between the United States and the USSR, including delays in the opening of the second front in Europe, the participation of the Soviet Union in the war in the Pacific, and the dropping of atomic bombs on Hiroshima and Nagasaki. 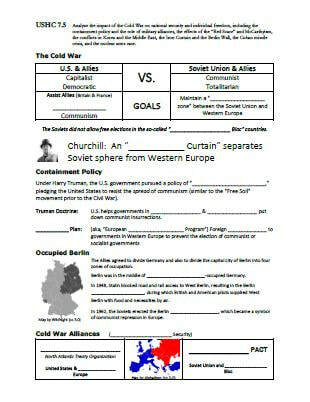 Analyze the impact of the Cold War on national security and individual freedom, including the containment policy and the role of military alliances, the effects of the “Red Scare” and McCarthyism, the conflicts in Korea and the Middle East, the Iron Curtain and the Berlin Wall, the Cuban missile crisis, and the nuclear arms race. The student will demonstrate an understanding of the impact of World War II on the United States and the nation’s subsequent role in the world.